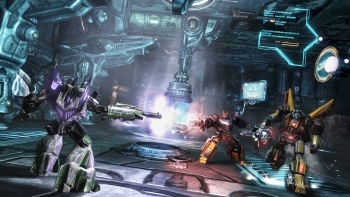 A multiplayer demo for the upcoming Transformers: War for Cybertron has been released on Xbox Live, giving gamers their first taste of that epic struggle. If you saw John Funk's hands-on preview of Transformers: War for Cybertron and, like me, desperately wanted to try it for yourself, you're in luck, because a new mulitplayer demo is now available on Xbox Live. The demo, which features the "Team Deathmatch" and "Conquest" game modes, lets players choose between the soldier and scout classes and customize their equipment, although sadly, not their appearance. You also gain experience and level up as you play, so you get a chance to play around with the special abilities and attacks too. Unfortunately, not everyone is going to get to play. The demo is only available for Xbox 360, and only those in North America can play it. If you don't fall into both of those categories, you're going to to have to wait. Transformers: War for Cybertron is released on June 22nd.